CMM Inspection vs. GMM Inspection. Speed is the name of the game. Revolutionary new inspection technologies are helping gear manufacturers develop and produce more complex, higher quality gears in a fraction of the time it used to take. When sending gears to be heat treated, manufacturers can end up unwittingly making mistakes that slow down turnaround time. We talked to some heat treaters to get their best advice on how you can help them help you. In manufacturing, we all know that tracking statistics on your operation is essential for understanding how you're doing, as well as identifying areas for improvement. But what does the efficiency metric actually tell you? In several applications like hoisting equipment and cranes, open gears are used to transmit power at rather low speeds (tangential velocity < 1m/s) with lubrication by grease. In consequence those applications have particularities in terms of lubricating conditions and friction involved, pairing of material between pinion and gear wheel, lubricant supply, loading cycles and behavior of materials with significant contact pressure due to lower number of cycles. Grinding of bevel and hypoid gears creates on the surface a roughness structure with lines that are parallel to the root. Imperfections of those lines often repeat on preceding teeth, leading to a magnification of the amplitudes above the tooth mesh frequency and their higher harmonics. This phenomenon is known in grinding and has led in many cylindrical gear applications to an additional finishing operation (honing). Until now, in bevel and hypoid gear grinding, a short time lapping of pinion and gear after the grinding operation, is the only possibility to change the surface structure from the strongly root line oriented roughness lines to a diffuse structure. 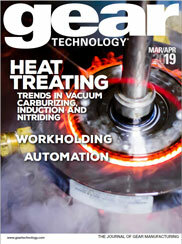 Help us by renewing your subscription to Gear Technology. The complete Product News section from the July 2017 issue. What is the relationship between angular backlash or mean normal backlash change and the axial movement of the ring gear in bevel and hypoid gears? Upcoming conferences, trade shows and events from the July 2017 issue of Gear Technology. AGMA adds two new committees, Star Cutter Celebrates 90 years, plus other news from around the industry. For over 50 years, the Do Nothing Machine has entertained the public eye with its complex machinery, a mountain of over 700 gears put together for the express purpose of doing nothing.